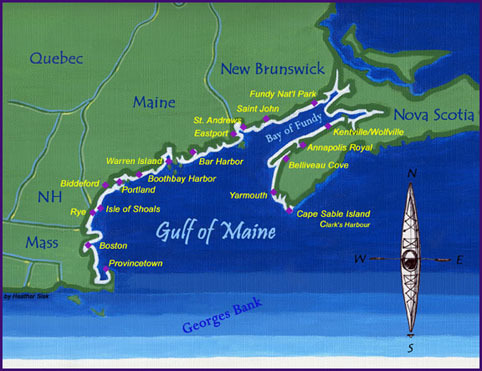 On September 28th, 2002, the Gulf of Maine Expedition came to its conclusion as the Team safely reached Cape Sable Island, Nova Scotia. During the intervening year we have continued to promote the Expedition’s mission to raise awareness and caring about the ecology and cultural legacy of the Gulf of Maine and its watershed while promoting low-impact coastal recreational practices, safety, and stewardship principles. We have presented the Expedition slideshow over 25 times reaching an audience well beyond 1,000 people. We have participated in meetings of Gulf of Maine stakeholders. We have continued to generate media coverage. We have offered new programs and begun new projects. Look for our revised website during the winter of 2003-2004. Click on the links below for final logs and images from the Gulf. The map below shows the major stops along our route.